Jewelxy Marketplace Pvt. Ltd. is a centralised, one stop Online Gems and Jewelry B2B, B2C & O2O Marketplace, which intends to offer businesses a complete solution to promote their quality products and services. Thus, bringing along marvellous opportunities to discover, connect and explore worldwide through a Global Business Networking Platform. 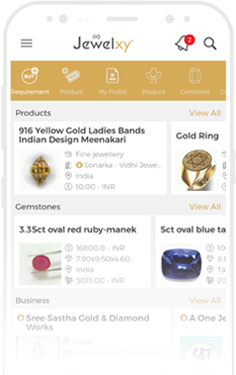 Being first of its kind, Jewelxy is an industry specific portal emphasises on valuable deals of gems and jewelry online thereby connecting gems and jewelry manufacturers, suppliers through retailers internationally and overcoming few existing associated drawbacks such as high promotional costs and disorganisation. Unlike typical jewelry business directory or an e-commerce platform, Jewelxy just not helps to save time and communicate directly with buyers and suppliers but also offers full-fledged security and assurance over conducting offline transactions and deals with verified businesses covering in-depth performance and analytics of your business. Escalate the possibility of growth in gems and jewelry industry across the globe. Digitising the gems and jewelry industry of India, we cater an opportunity for business of all levels to connect and stay up-to date with industry trends, news & offer global expo. Based on simple to utilize yet powerful innovation, Jewelxy.com is the right platform which facilitates two-way search that empowers business to pursue desired results. Add your business today to discover amazing opportunities and be discovered yourself!